En Mer appropriée "American Dream" est une retraite de 2 chambres w / loft - pour 6 personnes! Situé en bord de mer à quelques pas des belles plages de South Walton et des boutiques et restaurants de Seaside, l'American Dream est une tranche d'Americana spacieuse. Orné en rouge, blanc et bleu, ce gîte patriotique offre des détails architecturaux comme des plafonds voûtés, des escaliers en colimaçon, et bibliothèques intégrées et des bancs. actions de rêve américain exécutant porches et des balcons avec sa maison de soeur, Another Dream. Conçu un peu comme une maison en rangée, vous apprécierez vos principaux espaces de vie et salle à manger au deuxième étage avec une vue magnifique de la ville. Les espaces de vie de American Dreams comprennent une salle familiale spacieuse avec TV / DVD, un espace repas pour 6 personnes, et une cuisine complète. La buanderie et une salle de bain complète avec douche complètent le salon principal. Jusqu'à l'escalier en colimaçon, les clients pourront profiter de l'espace loft avec lit gigogne (2 couchages). Dans l'escalier en spirale sont les deux principales chambres à peu près identiques. Les deux offrent des lits queen, haut-bancs, d'une télévision, et des portes-fenêtres qui donne sur le porche principal. Le second bain d'hôtes avec douche sépare ces deux chambres. American Dream offre le meilleur dans la vie Mer. Venez pour le week-end ou un séjour pour la manière, American Dream est sûr d'être un rêve devenu réalité pour vous et votre famille et vos amis! We stayed in the American Dream over the 4th of July. It was a mother /daughter trip with two moms and two 11/12 year old girls. We thought the house was adorable! It has an old beach house charm, nothing fancy but comfortable. First I loved that you use a code and have no key to carry around! There is no parking spots with the house so you park right on the street beside the house. We had no problems with that because we rarely used the car, we rented bikes and rode everywhere. That was one of my favorite parts of the trip beside the gorgeous beach and charming town. We rented from Sandpiper Rentals which I guess was trying to do a great job. they knocked on our door the first morning at 7 am to see if everything was alright. It was until the woke us up!! It only got worse when they rang the door the second morning at 7 am to give us donuts and milk. That made us very upset to be woken up two morning in a row on vacation!!!!!! A text or phone call during the day would have been a much better idea. The house has a big screened porch on the first floor and the second floor also has a balcony with a swing. The ground floor has two bedrooms with queens beds which were fine. Maybe bring more hangers if you pack heavy like I do. There is also TV's in each bedroom. There is one bathroom on the first floor with a tub/shower. Fine for two moms to share but again may not be comfortable for two couples to share. The biggest issue in the house is the winding staircase to the second floor of the house where the main living room, kitchen and second bathroom are located. The staircase is very narrow and winding . The four of us were fine except it was very difficult to get the girls suitcases up the stairs to the loft . I would not recommend this house for young children ( under 7) , large people or anyone with knee issues. The living room was very comfortable for four people. Furniture is old and faded. The Tv, dining room table , kitchen and laundry room were fine, but the bathroom on this floor is VERY tiny. The third floor is the loft with a trundle bed which our two girls loved. 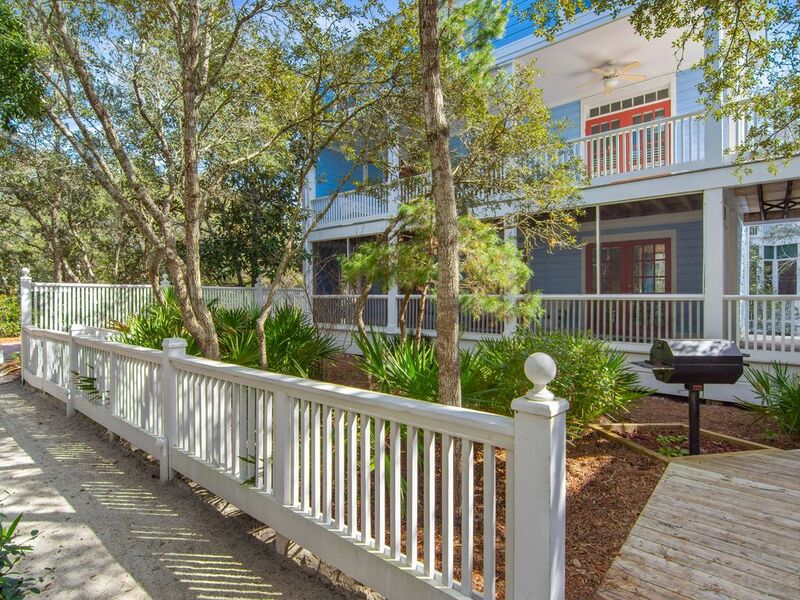 Overall cute old beach house thats in a great location but be aware of the winding stairs. The beach is across the main street from the neighborhood so we just biked there. Again we were fine but it would be a long walk for anyone with walking issues.